By Fahad Khan in Mobile. Updated on April 7, 2018 . The wont of reading books was very common few years ago but currently, people can hardly find the time to read a book from cover to cover due to their busy life routines. Audiobooks provide you with an easy way to listen to your favorite book rather than read it. You can do this while driving to work, or while taking the daily commute, while doing your daily job or running the threadmill at the gym. There are many audiobook apps that contain thousands of audiobooks in their database. You can search, download and listen to the book of your choice by using these apps. In this post, I have pooled together 10 best audiobook apps, both free and premium, for Android devices. If you think of any other app worth mentioning, please do let us know in the comments. 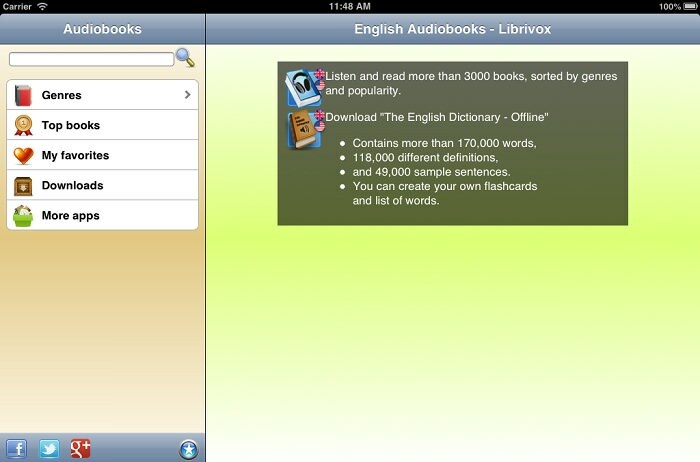 LibriVox Audio Books comes with a free audiobook app that has an interface that is easy to navigate. The interesting thing about the audiobooks found here, apart from the fact that there more than 15,000 titles available (50,000 if you are in the US) , is that they are recorded and edited by volunteers around the world. The downside here is that audio quality may vary, depending on the volunteers. Each audiobook can be streamed or downloaded. Most carried titles are classics e.g. The Adventures of Sherlock Holmes, The Adventures of Tom Sawyer, Pride & Prejudice, The Art of War, Dracula and more (in both fiction and non-fiction). If app no.1 is still not sufficient for your listening needs, Audible for Android is an app which contains an amazing range of more than 180,000 audiobooks not only in English but also German, French, Spanish, Russian and Italia. Apart from classic titles, you can also see recently published best sellers in the list such as Fault in Our Stars, City of Heavenly Fire, The Target etc. The app comes up with powerful playback features such as navigation of chapters, book marking, customizable playback speed, switching between reading and listening mode and much more. It also provides integration with Kindle with a fee. Here’s another great source for audiobooks. With a library of more than 60,000 audiobooks from almost every genre; you can find more than 2500 free audiobooks here, including those for learning foreign languages (45 languages and counting). The audiobooks can be streamed online or downloaded. Apart from being able to listen to variable narration speeds and automatic bookmarks, you get to seamlessly switch between desktop or mobile without losing track of your story. Sign up online and receive your first audiobook totally free. Subsequent books are available at $14.95 per book. Want to sharpen your language skills in English? This may be able to help. English Audio Books powered by Librivox provides free access to more than 3000 books which could be great for strengthening your listening and reading skills in English. Plus, it allows you to search and download the audio books for offline reading. 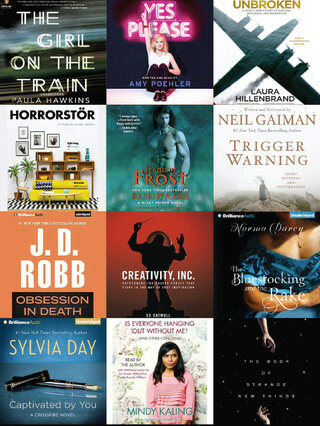 If you check out the catalog in the English Audio Books app, you will find history books, novels, biographies, poetry, short stories and much more. 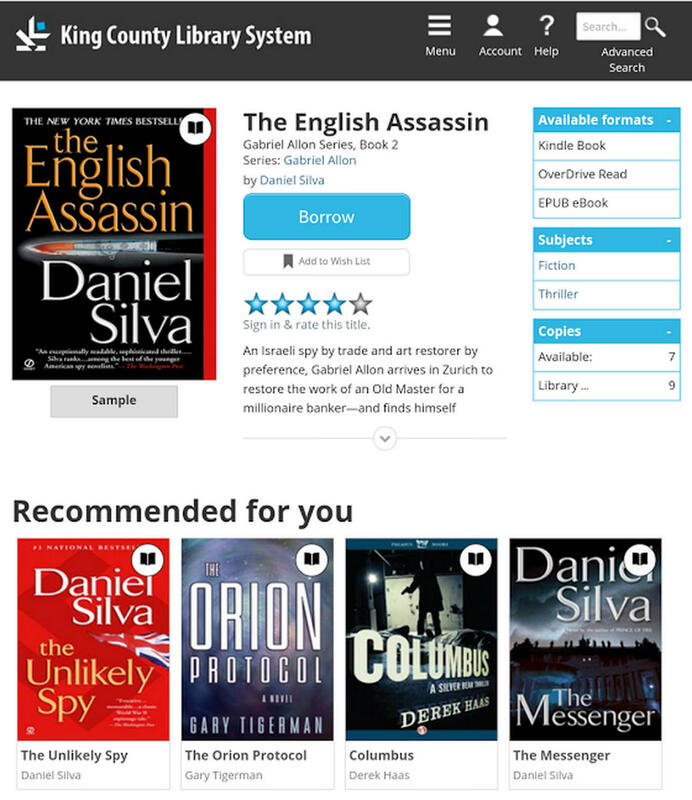 Using the search feature, you can find the book you need via title, author, genre or special keywords. 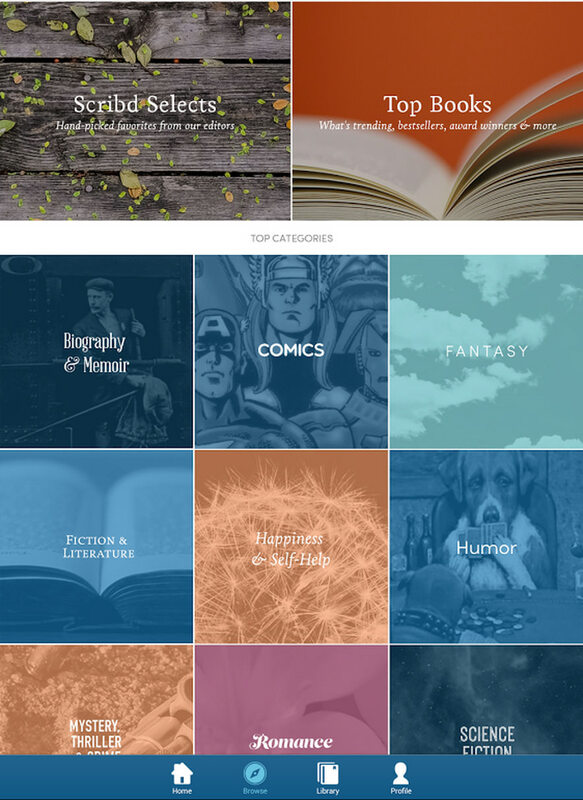 You probably know that Scribd is famous for providing a wide range of text documents and books to the readers but you might not know that the Android app of Scribd also comes with more than one million text-based books and popular audiobooks. Just download the audiobooks into your device for offline listening. The app supports cross-device syncing which means you can easily switch and listen to your audiobook on your many devices without losing the plotline. There were known bugs and problems in the player previously but many have been sorted out by their developers, helped along by user reviews and feedback. 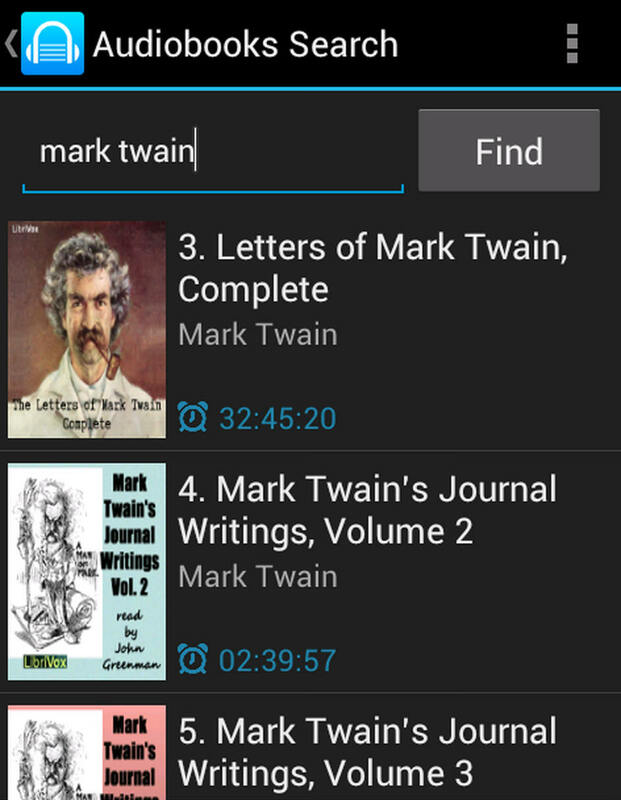 If you are looking for only classic audiobooks but don’t want to pay for books that are already in the pubilc domain then Audiobooks is the perfect app. You can stream or download a book from a collection of 2800 titles. The easy-to-use interface with a nice navigation control and sleeper time are the few key features of this app. You can search a book via title, author, genre, narrator, language or popularity, or you can just wing it and click the “Surprise Me” option for a random selection of an audiobook title. Be brave and just do it! There are 30,000 libraries around the globe that are providing their text books and audiobooks at OverDrive for their members. If any local library around you is available at OverDrive, you can borrow the books 24/7 from the provided collection of that library effortlessly and return it easily on time. 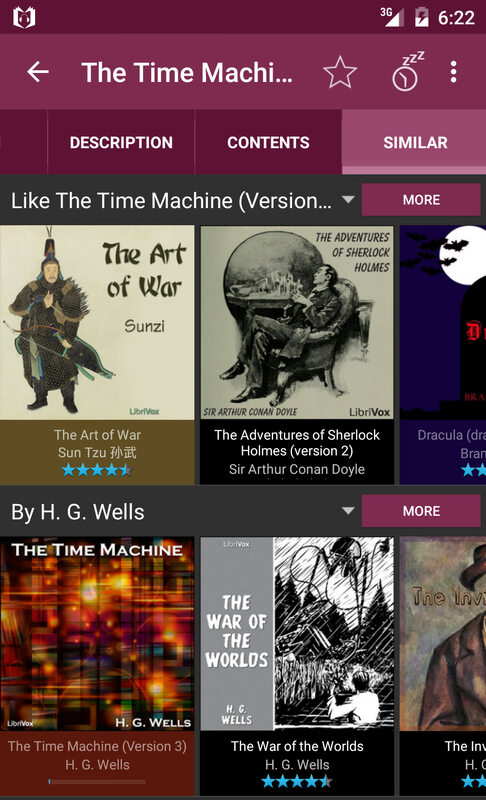 The app can narrate audiobooks at variable speed and has a volume boost option for those who prefer to listen to the books with a lower audio sound. On top of Android, OverDrive has support for many other platforms including, iOS, Windows, Kindle, Nook and Chromebook (find all platforms here). You can choose to not download any book but must then stay online to use the app. Adventure Audiobook Collection contains books only from the adventure genre and it is the perfect audiobook app for adventure lovers or children with an active imagination! By using Adventure Audiobook Collection, you can easily stream, download and play the audiobooks that are available in its database. 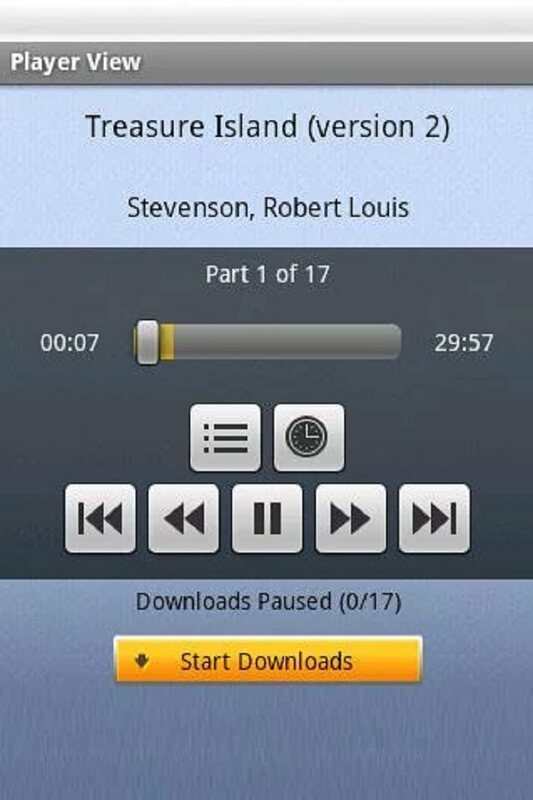 All the audiobooks in the database of this app are available in the public domain over the Internet; it’s a free-to-use app. 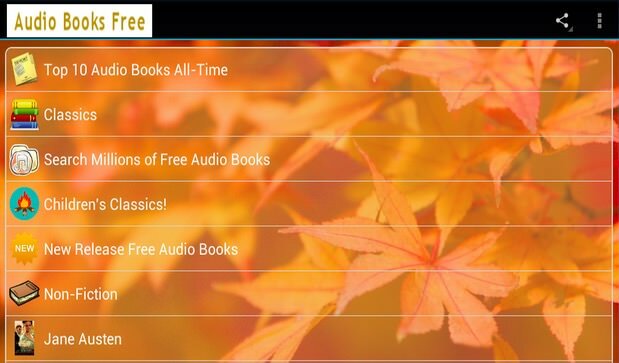 Search for free audiobooks available on the Internet in the public domain with Free Audiobooks Search App . By using this app, you can search for an audiobook via the title of the book or author’s name and listen to it via online streaming. It comes up with a large number of books in various genres. 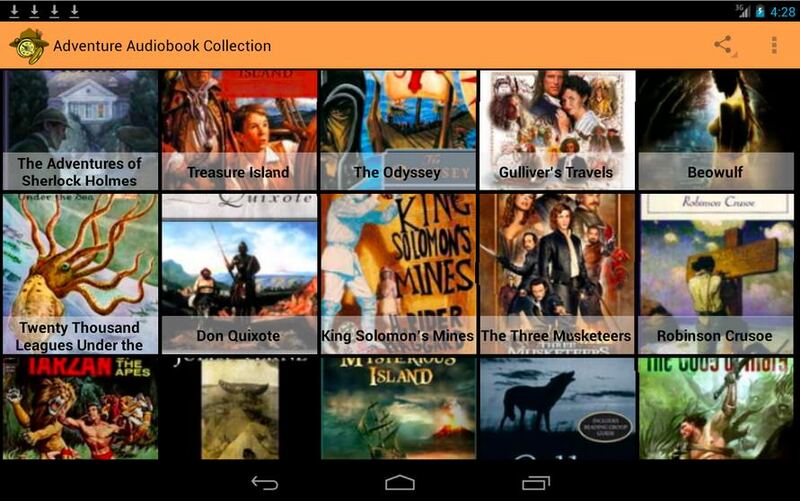 Audio Books Free is an app which contains more than 21,000 audiobooks in its search database. It mainly contains classic audiobooks in the public domain and children books. 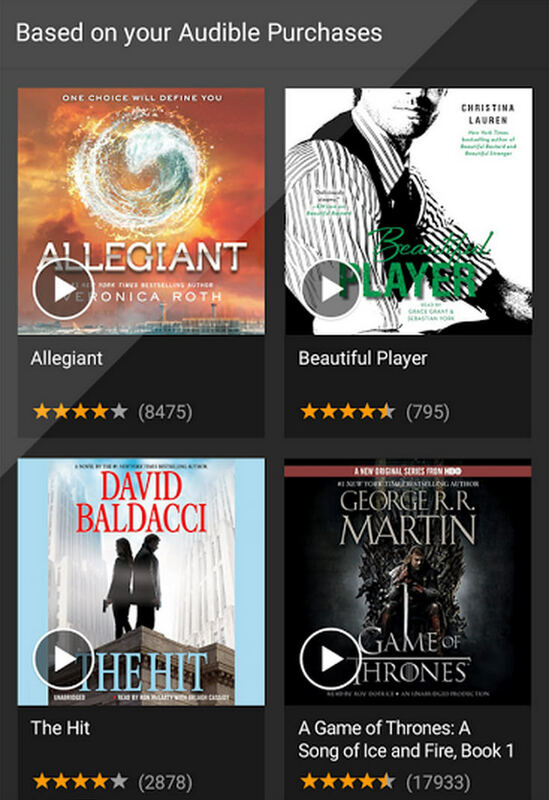 You can at any time see the top 10 most popular audiobooks available in the app database.